Ocular pain is also known as eye pain that occurs on the surface of the eye. Ocular pain is considered as a common medical condition that resolves on its own but, sometimes it creates emergency medical conditions. Globally, technological advancement in diagnostic test and increasing disposable income among population are the prime growth drivers of global Ocular pain market. In addition, emerging economies such as China, India and others, will create new opportunities for global Ocular pain market. However, overdose leads to severe respiratory depression or death is the key restraints for global ocular pain market. Geographically, Asia-Pacific is considered as an emerging market due to growing market penetration in this region. Increasing disposable income among population is also accounted for the ocular pain treatment market growth in Asia-Pacific countries. Rest of the world (RoW) holds fourth position in the global ocular pain treatment market due to poor economic and health condition in most of the African countries. RoW market growth will be fuelled by extensive increase in healthcare infrastructure in Brazil and Mexico. This report identifies the ocular pain market size in for the year 2016-2021, and forecast of the same for year 2021. 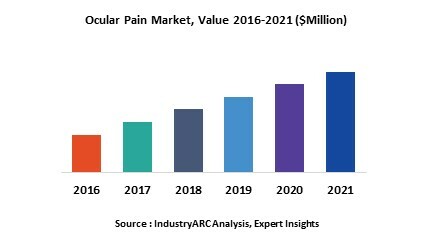 It also highlights the potential growth opportunities in the coming years, while also reviewing the market drivers, restraints, growth indicators, challenges, market dynamics, competitive landscape, and other key aspects with respect to Ocular Pain market. 13.9. Becton Dickinson & Co.
13.10. Becton Dickinson & Co.